Professor Fabien Gélinas, Ad. E., teaches and conducts research in the areas of international dispute resolution, common law and civil law contracts, commercial law and legal theory. 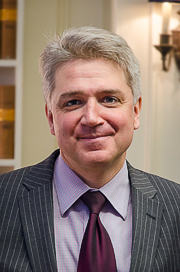 Formerly General Counsel of the International Court of Arbitration of the International Chamber of Commerce and past president of the Arbitration Committee of ICC Canada and the Canadian Chamber of Commerce, he is a member of the Quebec Bar and acts as arbitrator, expert and consultant on dispute resolution and legal reform. Professor Gélinas heads the Private Justice and the Rule of Law Research group and is a cofounder of the Montreal Cyberjustice Laboratory. He has taught at the Centre d’études diplomatiques et stratégiques de Paris (École des hautes études internationales), the Université de Paris II - Panthéon Assas, the National University of Rwanda in Butare, Trinity College Dublin, Sciences Po Paris, New York University and the National University of Singapore. Professor Gélinas was awarded the Barreau du Québec's Advocatus Emeritus (Ad. E.) distinction in 2017. In February 2018, he was appointed to Canada's Chapter 19 (Trade Remedies) NAFTA Rosterfor a ten-year mandate, and then in May 2018, he was appointed Norton Rose Fulbright Faculty Scholar in Arbitration and Commercial Law for a one-year term. International arbitration and civil procedure, international commercial contracts, cyberjustice, comparative law, international law, constitutional law and legal theory. Karim Benyekhlef, Jane Bailey, Jacquelyn Burkell & Fabien Gélinas, eds. How can we leverage digitization to improve access to justice, without compromising the fundamental principles of our legal system? eAccess to Justice describes the many challenges that come with the integration of information and communication technologies into our courtrooms, and explores lessons learned from digitization projects from around the world. Trade Usages and Implied Terms in the Age of Arbitration. February 2016. "...provides a clear explanation of how usages, and more generally the implicit or implied content of international commercial contracts, are approached by some of the most influential legal systems in the world. Building on these approaches and taking account of arbitral practice, this book..."
Comprehensive Economic and Trade Agreement between the European Union and Canada (CETA). March 2016. A.K. Bjorklund, J.P. Gaffney, F. Gélinas, H. Wöss, eds. "...This Special Issue undertakes a broad-ranging study of CETA, viewing it as an indicator of the evolution of EU trade and investment policy, and of the kinds of tensions and innovations that can be expected to arise as a new generation of 21s century trade and investment agreements emerges..."
Foundations of Civil Justice. Toward a Value-Based Framework for Reform. Springer, July 2015. 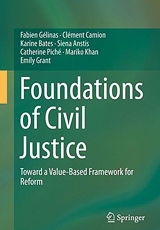 Gélinas, F., Camion, C., Bates, K., Anstis, S., Piché, C., Khan, M., Grant, E.
"...reviews the knowledge corpus about access to civil justice across disciplines and legal traditions and proposes a new research framework for civil justice reform. This framework is intended to foster further critical analysis of the justice system in a systematic and organized way..."